Turning this into an obituary blog is not my aim. However, if you are around my age (65) your friends and ex colleagues would be also quite old and queuing up to "go"...hahaha. So I cannot help but published the names of my friends and dear ex colleagues who had gone and blog about how much we missed them. For those who are here looking for juicy airline stories,this blog has plenty of them but inevitably will skip this particular posting. Please bear with us, as we old people are rather sentimental and like to dwell a little about our wonderful time with each other in the airline. Justin was one the senior crew I enjoyed flying with. He was a leading steward when I first flew with him on the B707. He was a good leader and one who did not "zap" his juniors unlike most seniors in those days. He was meticulous in his work but a bit kaisi sometimes. Justin was one who did not like the establishment but was nice to his crew. Why I said he was a kaisi? He always had this notion that he could be sacked if he did not do his job properly. Therefore,he had this habit of not trusting his crew and would tell us point blank that he would not cover for us if we erred. I heard that Justin was complaining to Pineapple Huat and Kia Su Lim while they were having lunch that he was having a flu. A week or so later, they were shocked to hear Justin had died of pneumonia. 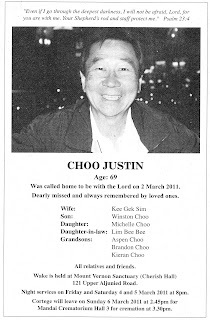 Smokey a retired IFS was advised by Justin not to drink too much at their lunch session about a week before was also shocked to hear Justin had died. Many of us could not believed that Justin had died. He was in the pink of health, one who did not smoke nor drink too much and yet died at a rather "young" age of 69 (his favorite numbers). Justin had a younger brother working with us in the airline too. He has since retired and is currently enjoying his retirement playing golf and looking after his grandkids, I was told. We will miss Justin and may he RIP.